I'd like to lighten up the admin header to make the backend feel nicer. The current header is a little heavy, and the darkness is really a carryover from previous designs. Attached is a mockup from johnonolan of the UI group. This ticket is just to change the css of the header and footer to be the same shade as the header bars for the dashboard modules. This should be done in both the gray and blue admin styles. After this ticket is closed, we might want to look at changing the 'visit site' button to be a link instead of a button, as the button looks a little weird. Picture 11.png​ (192.0 KB) - added by jane 9 years ago. wphead-bg.png​ (160 bytes) - added by johnonolan 9 years ago. wordpresslogo.gif​ (606 bytes) - added by johnonolan 9 years ago. screenshot-dd32.jpg​ (117.0 KB) - added by dd32 9 years ago. header-refresh.diff​ (58.4 KB) - added by johnonolan 9 years ago. This is my first ever patch - so I'm hoping I've created the diff file correctly. wphead.png​ (145 bytes) - added by johnonolan 9 years ago. wp-logo.gif​ (618 bytes) - added by johnonolan 9 years ago. screenshot.jpg​ (223.1 KB) - added by johnonolan 9 years ago. 12586.diff​ (1.1 KB) - added by matveb 9 years ago. 12586.2.diff​ (5.9 KB) - added by johnonolan 9 years ago. admin-header-footer.png​ (145 bytes) - added by johnonolan 9 years ago. login-header.png​ (133 bytes) - added by johnonolan 9 years ago. fav-arrow.gif​ (211 bytes) - added by johnonolan 9 years ago. wp-logo.2.gif​ (618 bytes) - added by johnonolan 9 years ago. 12586.2.2.diff​ (5.9 KB) - added by johnonolan 9 years ago. 12586-logoupdate.diff​ (424 bytes) - added by iammattthomas 9 years ago. wp-logo.png​ (2.5 KB) - added by iammattthomas 9 years ago. fav-arrow-rtl.gif​ (216 bytes) - added by johnonolan 9 years ago. [darker]admin-header-footer.png​ (2.8 KB) - added by jeremyclarke 9 years ago. darker-gradient-screenshot.png​ (137.7 KB) - added by jeremyclarke 9 years ago. Screenshot with darker light-grey gradient. screenshot-dark-grey-header.png​ (137.6 KB) - added by jeremyclarke 9 years ago. admin-header-footer.2.png​ (254 bytes) - added by johnonolan 9 years ago. 12586.4.diff​ (1002 bytes) - added by johnonolan 9 years ago. Moves background image call from colors-fresh.css to login.css in order to allow overwrites. login-header.2.png​ (2.7 KB) - added by johnonolan 9 years ago. Replaces image of same name. Removes white borders. 12586.5.diff​ (1.0 KB) - added by johnonolan 9 years ago. Updates fav menu to use gradient again, fixes padding. fav-top.png​ (155 bytes) - added by johnonolan 9 years ago. fav-arrow.2.gif​ (245 bytes) - added by johnonolan 9 years ago. fav-arrow-rtl.2.gif​ (246 bytes) - added by johnonolan 9 years ago. fav-top.2.png​ (134 bytes) - added by johnonolan 9 years ago. Replaces image of same name. Gradient adjustment. fav-arrow.3.gif​ (241 bytes) - added by johnonolan 9 years ago. fav-arrow-rtl.3.gif​ (243 bytes) - added by johnonolan 9 years ago. admin-header-footer.3.png​ (2.9 KB) - added by jeremyclarke 9 years ago. header-background-tweaked-comparison.png​ (44.0 KB) - added by jeremyclarke 9 years ago. 12586.3.diff​ (1.9 KB) - added by johnonolan 9 years ago. Also, we need to make sure the text and link colors are different in "Howdy, admin | Log Out" -- looks like they're the same in the mockup. @nacin: agreed that we'll probably want to revisit the button and link colors as well, but figured would have a ticket just to get the background lighter first, since that was a discrete task, and the arguments over shade variations for buttons etc can go on a long time. :) Planning to check in with MT on the buttons. Agreed on buttons - I'll do some work on that this week. RE development of the bars: This new bg is now moving away from the previous block-colour and is using a subtle gradient + two built in 1px borders (top and bottom). I've created a 1px by 46px PNG8 image which I'll attach after this message, this should fit inside the exact dimensions of the current #wphead. @johnonolan: can you also upload the WordPress logo you used in the mockup? I can then build a quick first patch for it. Hi Mat, coming right up - give this one a try, hopefully the quality on the gif transparency won't be too harsh. I'm finding the attached background image is -too- light, Ideally to me it should be a darker shade than the metabox handles for a start. The favourite actions dropdown will need a change of tone too i think with this. The only other "problem" i see with it, is that the Selected menu item also clashes a bit, I find the dark menu item against the rather light header just too much of a contrast change. As for the footer, Its virtually invisible with this at present..
See attached screenshot. As for the colour choices of the text, I've chosen #464646 as thats the logo colour. Hi Mat, yeah there are several things not quite right in that screenshot - I think it'll probably be easier if I have a go at a patch for this myself so that I can fix some of these issues as they come up. Keep in mind that this ticket does not include the buttons - those are still to be finalised. If I've done anything wrong in the way I've submitted the patch then please let me know for future reference! You don't need to worry about the compressed files. We'll handle that anyway on commit, and it keeps the patches small and neat. I am uploading a new diff based on yours. Check if this works for you. I also changed the user_info links to #111 instead of #000. Full patch for this ticket added above, this includes main admin header/footer bg, admin header favorites menu, deletion of visit site button (RIP), and login header bg. Also cleaned up some of my own code from the last version of the patch. The alternate colors don't break with this patch - so feel free to do some tire-kicking. I have an updated patch with the alternate colors ready, but (in short) I think it's painfully ugly and inconsistent, so I'm going to run that one by the UI group first! Committed so everyone can have a look. I'll do the file deletions once we're settled. Worked with Ben Dunkle to get a redrawn WordPress logo that's sharper and better complements the WP admin icons. wp-logo.png replaces wp-logo.gif in /wp-admin/images/. Hold off on this - tabs are currently under revision by TECannon for the UI group to better complement the new header bg color. I think they're going to solid white - which will blend with the white border. tabs are currently under revision by TECannon for the UI group to better complement the new header bg color. I think they're going to solid white - which will blend with the white border. We can add it back if it works, no problem there. Nice idea - I assumed we required IE6 support, which is why I didn't do this originally. I'm seeing a one pixel white border at the top. Is that intentional? Thats because of the background image, it has at the top a white line. Yes, there is also a slightly darker grey 1px border at the bottom of bg image. This matches the style used in the main menu on the left - however it did look clearer/better with the 1px white border at the bottom too. We'll be able to finalise this once the UI group has decided on the screen-options tabs next week. I'm with dd32 in thinking the current shades are problematic and can definitely be improved by changing the brightness to match the rest of the UI. The gradient in the site header should match the ones in the screen options tabs and widget headers. They are too similar to not match IMHO. After this first commit the header is much lighter than the other gradients which actually makes it seem less important. In theory we could change the other gradients to be lighter than they currently are but that seems like the wrong direction to go in. Making the header a bit darker feels a lot better to me, more solid or something, and it won't look empty on low-contrast screens. THAT SAID: I am against this mid-grey scheme entirely. The header should be a dark grey gradient to match active sidebar headings. IMHO the header should not be the same color as the screen options and dashboard widgets (as well as the post metaboxes and visual editor() which share the same gradients), instead it should match the active sidebar section header (i.e. 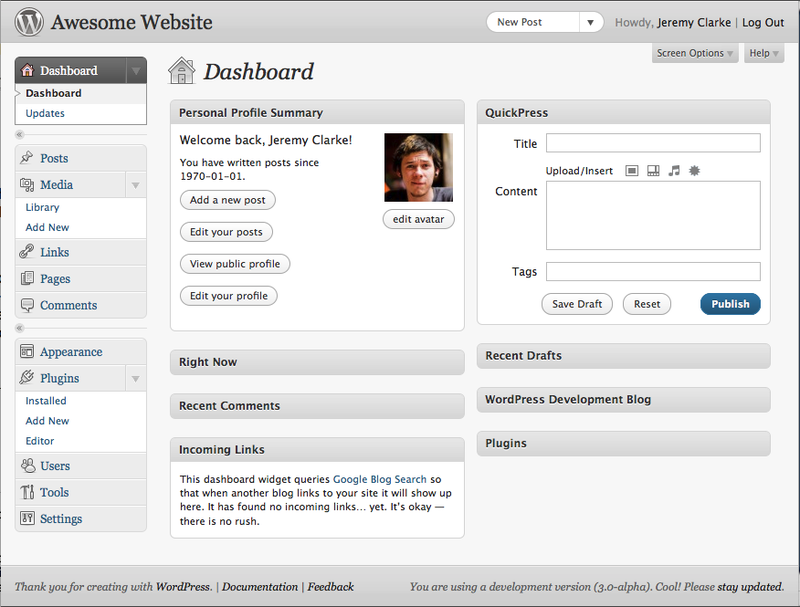 Dashboard for dashboard screen) as shown in the middle example above. The medium grey gradient is overused in this design and the overall effect is mushy and low-contrast, everything blends together and seems made of the same plastic. Having the dark header makes it stand out more, bracketing the rest of the UI. I think the high-contrast of the old header is one of it's virtues, and I always liked the way it integrated (even though now I admit that it's color doesn't match anything else). FWIW I also think the pure-white favorites menu feels very strange and not button-like, it feels like a text field. With a dark grey gradient we'd be free to use some light grey UI for the favorites menu, preferably the light button style from Save Draft. This medium-grey approach is also a big change from the old version. Sure its nicer than the 2.9 style, but the amount of difference will be upsetting to users for no good reason. If we used the dark grey of the sidebar headings then the change will be much more subtle and ultimately no one will complain at all. We will just have rebalanced the colors so that they are more harmonious (and added a good-looking gradient and fun logo in the process). If you look at that twitpic comparison ( ​http://twitpic.com/16mf3n/full ) of the old->dark->light versions I think the middle one is pretty convincing. I'll try to work up a full screenshot to compare the full pages with dark and light gradients in the header and footer. I think the middle one is quite compelling; it reduces the heaviness of the original header but does help anchor the top of the page. Agreed about the currently-implemented light background "blend[ing] together" and "made of the same plastic." Also agreed about the favorites button currently looking like a text field -- I assumed that was still being worked on. I do think the light header grows on you, but I'd tend to +1 this. Just a note though, that's from JohnONolan, who mocked that up for the UI group. The UI group chose the light version. @nacin Yeah I was going to say that it wasn't my original mockup. John was on the right track from the start and both of these options are good, though I think the ui group missed a few important considerations in choosing the light version so I wanted to bring up the issue again. 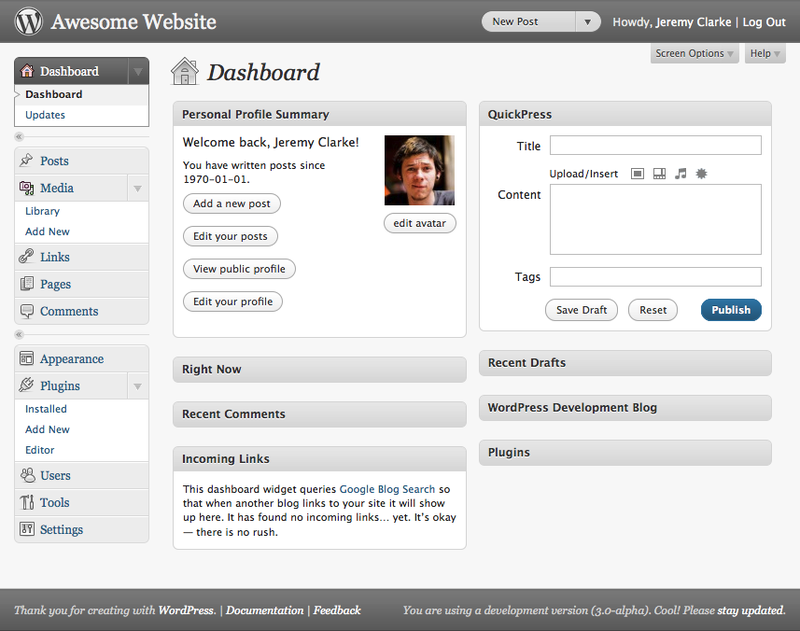 Above is a screenshot of the admin with a follow through on John's original dark-grey mockup. It matches the active sidebar heading and I think it shows off the value of the darker look. As nacin said the light version definitely grows on you, but I can't help thinking that the contrast provided by the darker one is worth any downsides it might have. I also used the subtle and beautiful WP logo from the ​http://wordpressfoundation.org/ page. IMHO its the nicest WP logo I've seen so far and should be considered for the admin header whether we go with the light or dark version. Personally I really like Jeremy's version. Coordinating colors and changing the logo worked wonders for me. @jer - In short, you're a bit late to the party on this one. The dark and light versions which you referenced were created, compared and decided upon by the UI goup almost a month ago - and many hours of work have been put in based on those decisions. The shade of grey which dd32 referred to above was also not the one which made it into the latest nightly build. These sort of things (esp. UI related) aren't really things that you can come in at the last minute on (as you saw myself try to do with the new tabs on the themes page ;) The best thing to do is attend the weekly UI meetings where all these things are discussed, and decisions are made. If you want to submit mockups - the best place for that is ​http://make.wordpress.org/ui - Where Jane Wells (who has final signoff) will be most likely to see it. Trac is (mostly) for code. Sorry if you guys feel like this is totally settled already but I don't think its too late to review the decision at this point. This was the first commit and it was a draft that has had other criticisms in this ticket. My changes aren't any more significant code-wise than the tweaking that we should be doing either way. I thought those who weren't at the meeting might like to be reminded of the decision that was made and the option that was decided against, especially those who weren't aware that the change was coming before this initial commit. People who I've shown this to tend to like the darker one after a minute of convincing, I wanted to see if many other people here might agree. FWIW John, I liked your designs and am really glad that you decided to put them together in the first place, the options you gave were just so good that I fell in love with one :P Whichever shade ends up in core it will be a big improvement on what was there before. Everyone is right, sort of. The UI group chose the light header based on the mockups of the three, and there was a lot of design-specific discussion around it that I don't think belongs on Trac. As has been suggested, we have a UI blog and a UI chat now, ostensibly so that development tickets can focus more on implementation and code than on picayune aesthetic details, and so designers can guide design decisions rather than them being made only by developers. The newly contributing designers who have worked on stuff like this should be appreciated. They're not trying to take something away, they're trying to contribute their professional expertise. People who do both should be involved in both. That said, almost every design change is an experiment. You can't tell from comps how something will feel when it's in use in a live application, and the process is basically make a decision, see how it feels, edit if needed. I also voted for the lightest header in the UI meeting, and didn't go for the middle one because it was a bit too dark, and picked up the nav on state color, which I looked weird. I've heard from a number of people who didn't like the light one at first, but say it has now grown on them and they like the lightness of it. For me, using it live has made me like it a bit less. The 1px white line is part of it; it makes the application feel unanchored to be separated from the top of the browser window by that line. Another part is that now the on state (for Dashboard, in all the mockups people are doing) is the most prominent thing on the screen, which I find unsettling. Either way I think we should rethink the on-state color; it's darker than it needs to be and looks muddy. Making the header gradient just slightly darker, like in ​http://simianuprising.com/wp-content/uploads/2010/03/darker-gradient-screenshot.png feels appealing in terms of providing a bit more of a visual anchor. I definitely do not want to go back to the super dark header. And the light header could still be great if we got rid of the white line on top and lightened/changed the on state for the nav. I'm comfortable trying either direction as a next step. I think the white border at the top only looked good when in harmony with the white border at the bottom which was stripped out when it went into trunk, so agree that can be nixed if the one at the bottom is definitely going. The white border on the bottom made the screen options and help tabs not flush with the header. In any case, the gap between browser and header makes it feel unanchored. I'll upload a fresh image for that now - we also need a decision on whether IE6 is being supported, if so then the PNG version of the logo + patch shouldn't have been committed. Alpha transparency is supported in IE6 with a single line of CSS; it's more a matter of needing a patch for IE6 if we're supporting it. I've yet to see an IE6 PNG transparency fix that works - but if it can be done then that's good, I think the new version looks excellent. I've run into a few issues with this TRAC update when using custom Login Pages. It happens with the body.login being attached to an image. When trying to use a custom background image, I've attached it to the body element. The issue I'm having is with the order of the cascade in the CSS. The file /wp-admin/css/colors-fresh.css is loading after the /wp-content/themes/themename/custom-login/styles.css. Personally I'd prefer that any theme based CSS loads after any core based CSS. I know this might cause some issues if the theme designers use style names that resemble the core styles. Anyone else have thoughts? When I return from work, i'll take a few screenshots with Firebug and Firefox so I can show the differences in the changes that are made. Nacin has suggested adding the bg image call to login.css rather than colors-fresh.css, would this solve your issue? Looking at the most recent version it seems that the shade of grey in the header is still problematically lighter than the dashboard widget headings, screen option tabs and visual editor chrome. All of them are darker but still too close visually to feel like a seperate shade. Re-inserting my previous darker version of the light header background image (not my radically different dark one) it seems too dark now. I think the right answer is either a version that is slightly darker than jononolan's or else to make the various other UI elements mentioned lighter to match the new header. Personally I think matching the existing shade of the other UI elements is a good idea, especially because they are dark enough to be distinct from the inactive sidebar menu headers which are fundamentally different. I also re-did the gradient itself. The version in trunk right now seems to be suffering from too much lightening and darkening, it has those super-subtle horizontal lines that feel like an optical illusion but aren't. The new version is smooth. To future proof this can we stick with a png logo, with transparency, rendering any future changes to background colour irrelevant. I replace the header image with a custom logo on many of my Wordpress sites. It helps distinguish between many admin areas in many tabs! Is someone working on a 'lighter' version of the blue style? Or was it only for the grey style? I believe this has been finalised for this version? Please open new tickets for future releases. (In ) Use CSS3 gradients for the admin header and footer. Fall back to a solid color for IE. Props JohnONolan, fixes #12586. (In ) Remove files replaced by CSS3 gradients. IE falls back to solid colors. see #12586.